Now comes Matthew Burden at Blackfive to respond to Michael (and I guess, me too). I won’t rehearse what he says about the issue, and if he feels like it, Michael Yon can respond to Matt’s problems with the issue. But of me, Matt says the following. The Army is the only Service that is dedicated to this essential mission. 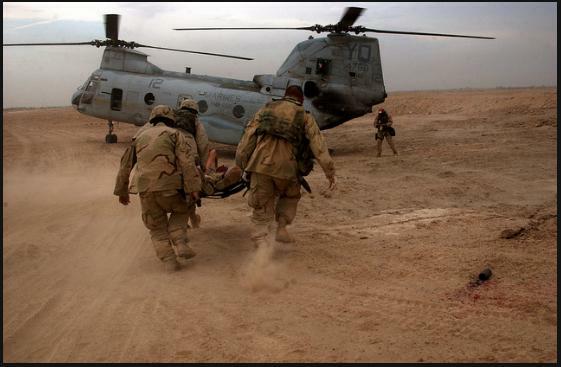 In fact, other uninformed bloggers claim that the Marines don’t do Medevac. That part is correct. However, to assume that’s because “The U.S. Marine Corps doesn’t do business this way” is incorrect. That is because the Army provides that service for the Marines, Navy, and Air Force. Just like the Marines don’t do CSAR – because the USAF has the lead on that. Not because they don’t do business that way (bold his). Well, goodness. So now I don’t warrant a note (and Matt has my e-mail address), and my name doesn’t even deserve honorable mention. I am now just an “uninformed blogger.” This is extremely bad form. I expect such things from some of the bloggers at Blackfive, but I had not expected this of Matt. I never made the claim that the Marines don’t do MEDEVAC. I just made the claim that they didn’t do it that way. Matt has conflated two issues, i.e., MEDEVAC in Afghanistan with MEDEVAC generally. I also never made the claim that the Marines do MEDEVAC in Afghanistan. But the Marines did in fact do MEDEVAC in Iraq. Let’s rehearse just a bit. These are some of the things I already know. I am just linking and pointing them out so that you do too. Here is a Marine Corps CH-46 (Sea Knight) performing MEDEVAC in Fallujah, Iraq. Did you see any red crosses? Here is another MEDEVAC. And as for my own personal knowledge of this issue? Do you recall this picture? This was when my own son had to be MEDEVAC’d out of Fallujah in 2007 (this turned out to be a leg injury that didn’t require his return to the States, and after a week or two of light duty, he was with his fire team again). 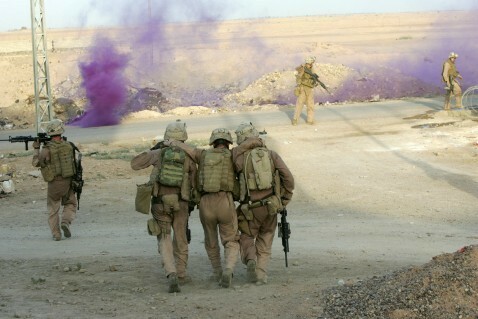 He is being carried out, the Marine on the far left is carrying his SAW. The bird he caught out of there? Why, it was a CH-46, Sea Knight. By the way, I have strongly recommended delay in retirement of this magnificent aircraft, since it is the only platform from which the Marines can fast rope (the V-22 cannot fulfill that function). But then, that may be beside the point, and oh well, I guess I am just being an “informed blogger” again. Sorry to bore you with the facts. So there. I guess that closes the case for me – again. The Marine Corps and Army do MEDEVAC differently. Like I said, I expected better of Matt than this. But then, that’s not a mistake I’ll make again. How sad.